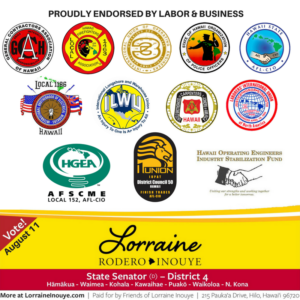 I appreciate this endorsement but am even more grateful that so many individuals and organizations have stepped forward in recent months to convey support. 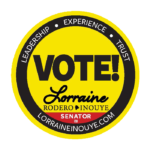 I have worked hard to earn the trust of both constituents and legislative colleagues and also county, state and federal officials and other community leaders to move things forward for the people who live in Sen. District 4 and all of our island and State. It is encouraging to know that there is confidence in my leadership. However, it’s not a done deal. The Sat., Aug. 11 PRIMARY ELECTION is still critical – and turnout is extremely important. 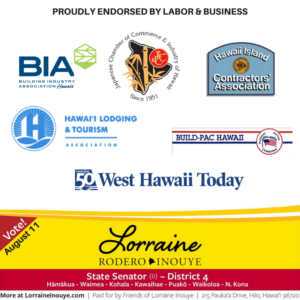 We urge you to please be sure to vote – early is best — and encourage your ‘ohana, circle of friends and co-workers to do likewise. Walk-in Absentee Voting continues through Thurs., Aug. 9, 8 a.m. to 4 p.m. at Waimea Community Center and in Hilo and Kona. You can walk in to any of these locations, show an ID and vote. It takes only about 15 minutes. Many of course have already voted…and there’s also Election Day, Aug. 11, 7 a.m. to 6 p.m. at your Precinct. For the very first time ever in Hawai’i, residents can walk in on Election Day, REGISTER and VOTE! This is particularly helpful for those with young adults just reaching voting age, and also for anyone who has changed their name/address or knows of someone not registered. A photo ID is required along w/ a utility bill that shows your name and street address. It’s been a hectic 12 months, beginning with a Special Legislative Session last August that included an extreme battle over Honolulu ultimately stealing our neighbor island TAT for rail. I’m still livid and determined to remedy this. Then, there was the 2018 session, which actually was extremely productive and progressive. Then, we began a very hectic schedule to reach out to the distinct communities that make up Sen. Dist. 4 to discuss legislative progress and concerns in preparation for the election. I participated in 6 candidate forums plus at least two dozen other community meetings and also participated in a dozen or more celebrations for major infrastructure and programs, ranging from the $70 million improvements at the Port of Hilo, to a new dental clinic in Waikoloa, from the blessing of the 9 Bravo volunteer fire “station” in Anekona (Waimea), the dedication of the $15 million STEAM Learning Center at Waimea Middle School, and dedication at Hilo Medical Center. I also met with a wide array of farmers throughout the district, most notably for the $1.5 million ag water study to map out water availability, needs, and infrastructure for the next 50 years. As you know, I am, at heart, a farmer who grew up in the plantation village of Wainaku where taking care of each other and our little village gardens was how you survived. So…I am humbled to have served as your State Senator, Mayor and Council member. I view these elected positions as doing the people’s work…listening to your needs, concerns and dreams…and finding solutions. I’m very proud to have successfully brought home more than $420 million over the past 4 years for projects that residents of the district asked for. 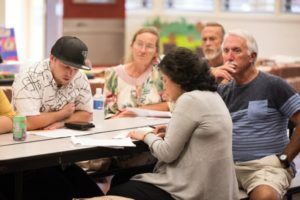 This included expensive bridge repair, rockfall prevention and $40 million for improvements to all of the Districtʻs public schools from Papaikou to North Kohala to Waikoloa. Plus hospital and healthcare improvements, environmental protection and climate change mitigation. 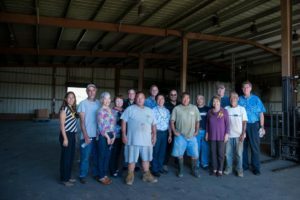 I also secured $135,000 for Hamakua Youth Foundation, $88,000 for the Waipi’o Valley kalo farmers, and $75,000 to help start a North Kohala radio station to provide that isolated community with emergency communications coverage. We also secured funds to train new farmers, fight invasive species, protect natural resources and help ranchers build a needed slaughterhouse. Every dollar secured represents a ton of work. You need at least 13 votes in the Senate to move anything…so you must have relationships with colleagues to successfully bring home more than $100 million every year. These are your tax dollars coming home as they should, and they will touch many lives. 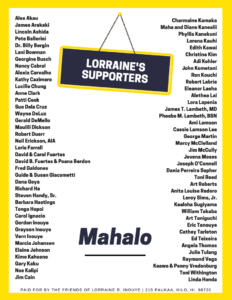 I personally saved a bill to reduce foster care social worker caseloads on Hawaii Island. I wrote and secured passage of a bill – now signed into law — to enable homebound kupuna to secure necessary identification to care for themselves and their loved ones. We call it DeEtta’s Law because it was inspired by a homebound kupuna right here in Hamakua. Working with constituents, we helped create a work group with funding to expedite cesspool conversions to protect drinking water and marine resources. My Senate Energy Committee helped set a 2045 deadline to convert our state entirely to fossil fuel-free electricity. That’s BIG! We passed a bill to ensure that, if the White House or Congress mangles the Affordable Care Act, Hawai’i citizens will still have protection for pre-existing conditions and children up to age 26. These are just a few of the things I’ve been working on. Sometimes smalls steps, sometimes giant progressive ones. I’m pleased with the progress we’ve made, yet know there’s still much to be done. 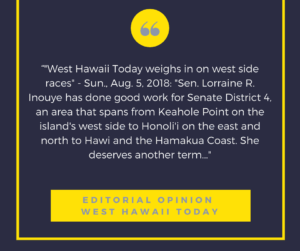 Most urgent, we must reduce the high cost of living, protect our quality of life and provide our young people with the educational supports to thrive here on Hawai’i Island. Again, thank you for your support – please remember to vote and please call or email whenever you have questions or suggestions.